In my last blog, I introduced you to the Santa Cruz Mountains AVA, now it is time to visit the region. Every year, I take a group of people wine tasting somewhere along the Central Coast of California. This year the trip was to Santa Cruz, but we stayed in Monterey. The drive is about 6 ½ hours from Southern California, taking Interstate 5 up to Hwy 46, heading into Paso Robles, then up Hwy 101 to Monterey. Since the drive “forced” us through Paso Robles, we made a quick stop at Barr Estates, to pick up a few bottles of their Petit Verdot, then a quick stop for lunch in San Miguel, at the Country Diner (recommend by Yelp, and a good choice). Before moving on to Monterey, we made another quick stop at San Marcos Creek Vineyard to pick up some Zinfandel, and the newest release of their club wine: “Fling’s First Crush”. We arrived at the Monterey Beach Resort (now known as Unscripted Monterey). 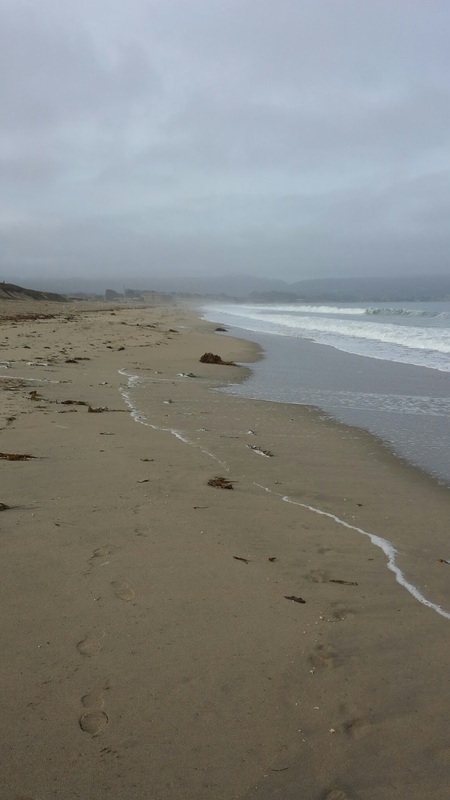 The hotel is the only one in Monterey that is located on the beach. As we found out, it is also very popular for weddings. We sat in the lobby, watching the surf, and keeping an eye on our arriving group of 24 people. Dinner that evening was at Restaurant 1833. The meal was probably the most adventurous dinner of our trip. The food combinations and eclectic menu choices made for a fun evening to kick off the weekend. I would definitely go here again. Saturday morning was the day we were all waiting for…a trip to the Santa Cruz Mountains. I had hired Evan Oakes with Ag Venture tours to guide us to the four wineries on our wish list. We had used AgVenutures a few years back, and were impressed with Evan’s knowledge of the wine region and the local agriculture. This year was no exception. As we drove up Hwy 101, and later Hwy 85, towards Cupertino, Evan pointed out all the crops growing on either side of the highway. Soon we turned west and headed up the eastern side of the Santa Cruz Mountains. The roads became winding mountain roads only wide enough for 1 ½ cars (or a 24 person bus like ours). We shared the road with many cyclists out for their morning ride. About an hour and half after leaving Santa Cruz, we arrived at our first destination: the Monte Bello Vineyard for Ridge Vineyards. Ridge Vineyards tasting room is located at an elevation of 2,600 feet, and overlooks the southern end of the San Francisco Bay. The Monte Bello Vineyard was originally planted in 1886 by Osea Perrone, and is home to one of the most iconic Cabernet Sauvignons in California. It was the 1971 Ridge Cabernet that was entered into the “Judgement in Paris” competition in 1976. At that time, the wine placed 5th in the competition. At that time, the French complained that California wines might have beat them at that time, but California wines couldn’t age in the bottle. Thirty years later, the same wines were blind tasted again. This time, the 1971 Ridge Cabernet came in first! During our visit to Ridge, we were lucky to have met with David Gates, the Vice President of Vineyard Operations, who works directly with Paul Draper, the renowned winemaker/owner of Ridge. David talked about the most recent harvest, and different vineyards. All this, while we tasted examples of their Chardonnay, Zinfandel, and Cabernet (including the famed Monte Bello). A bottle of their estate Chardonnay, and Monte Bello Cabernet, as well as a magnum of the Lytton Springs Zinfandel, now make a home in my wine cellar. Our next stop was at Savannah-Chanelle Vineyards. When I scheduled these wineries, I simply looked for the historic wineries, and figured they were close enough to be able to hit quite a few. On the map, they are close together. In reality, getting around is no easy task. The roads are typically deadend roads that require you to retrace your drive, then head up another valley to the next location. The roads are mountainous, narrow, and often covered in fog. Unlike Ridge, which overlooked the valley below, Savannah-Chanelle is tucked in a mountain valley, surrounded by heavy forest. The contrast of the vineyards and the pine trees makes for a stunning setting. The winery’s history goes back to 1901 and the establishment of the Pierre C. Pourroy Winery. Today, the historic vineyard house still stands at the top of the hill. It was here that we set out a large lunch spread, and enjoyed the views with bottles of wine and bottled water. The tasting room is located in a large wooden barn, and had three tasting bars. The place was packed with people (the most we saw on all our wine tastings). This may be because the winery is more accessible, being located just outside of Saratoga, and the Silicon Valley. Our next stop had us heading over to the western side of the Santa Cruz Mountains, to another iconic winery, David Bruce. Dr. David Bruce, a dermatologist who had worked for Martin Ray and then helped crush Monte Bello grapes for Ridge in 1961, before founding his own winery in 1965. Bruce, a Burgundian by heart, took advantage of the cooler western slopes, and planted Pinot Noir and Chardonnay at the 2,200 foot elevation, overlooking the Monterey Bay. Similar to Ridge, David Bruce was also included in the “Judgement in Paris”, but in the white wine category. The 1973 David Bruce Chardonnay placed 10th in the tasting. While Chardonnay is still produced at the winery, the focus is certainly more on Pinot Noir. During our private tasting, we tried numerous wines, as well as different vintages. I left with a couple bottles of the 2008 Santa Cruz Mountain Pinot Noir (one signed by David Bruce). Our final stop of the day was a pick from our guide. We headed back down the mountain towards Santa Cruz, and sat down on the outdoor benches of MJA Vineyards. We were heartily welcomed with “aloha”, and poured numerous wines. A solo guitarist played and sang in the patio. The winery produces two labels: Serene Cellars (Napa Valley) and Davine (Santa Cruz Mountains). Their main tasting room is located in Santa Cruz, and the location we went to is their mountain tasting room, surround by redwoods and pines. Back to the “aloha” welcome…the winemaker/owner also farms Kona coffee, and the laid back approach to tasting, and even serving chocolate covered coffee beans with the wine, made for a fun end of the day. We left the hotel at 9:15 in the morning. Made it to four wineries, and returned to the hotel at 6:30. For anyone looking to go wine tasting in the Santa Cruz Mountains, I would suggest either staying in Santa Cruz or Silicon Valley. You’ll save yourself some drive time. For us, we like the restaurants in Monterey, and were willing to take a little extra drive time. Speaking of restaurant, our dinner on Saturday night was at one of the finest restaurants in the Monterey area: Passionfish. The focus is on fresh seafood and local produce. The focus is so strong on the food that the management has chosen to only do small markups on the wine. We found wines at half the price of other restaurants in the area. For foodies and win geeks, this was heaven. 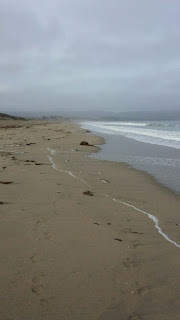 In my next article, I will fill you in on the final two daysof our trip to Santa Cruz and Monterey. A few years back, I wrote about the Central Coast viticultural areas. No one commented on the lack of information about the Santa Cruz Mountains AVA. My guess is that most hadn’t heard of it, or had about the same limited exposure to this area as I had. Well not anymore. For this article, I will rectify the glaringly small blurb, and share what I learned on a recent trip to the region. Wine production in the Santa Cruz area dates back to around 1804, when the Franciscan missionaries and later the Jesuits, settled in the area. The church usually planted mission grapes to create their sacramental wine, but the cooler climates produced a bitter, inferior wine. For that reason, Black Muscat was planted, and used to make a sweet, port-like, wine. The best known was made at the Novitiate Winery, now the home of Testarossa Winery. The mountain vineyards would arrive later in the mid 1800’s, as a result of logging in the Santa Cruz Mountains. Loggers cut over 18 million board feet of redwood, leaving large swaths of land cleared. Cleared spaces allowed homesteaders to plant fruit, vegetables, and vineyards. The first known vineyard, in the mountains was planted by a Scotsman names John Burns, who named the mountain near his vineyards, “Ben Lomond”, after a wine district in Scotland. The vineyards spread over the mountain and down into the Santa Cruz area when an “Italian Wine District” was established. By 1875, existing records noted that Santa Cruz had 262,275 vines (about 300 acres) and was making 70,000 gallons of wine a year. By the mid 1880’s, the Santa Cruz Mountains were producing award winning wines, not just locally, but world-wide. 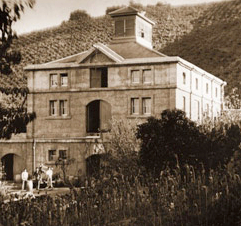 The Vine Hill Winery won international acclaim in 1884, and the Ben Lomond Wine Company won at the 1889 World’s Fair in Paris. Unfortunately, a huge forest fire tore through the Santa Cruz Mountains in 1899, destroying many wineries and most of the vineyards. 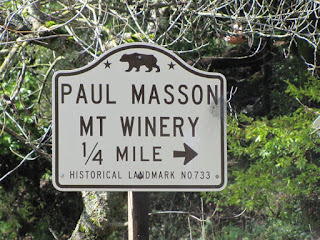 Winemaking took a big turn when famed Frenchman, Paul Masson, planted 40 acres of vines above Saratoga in 1896, and opening a winery in 1901. 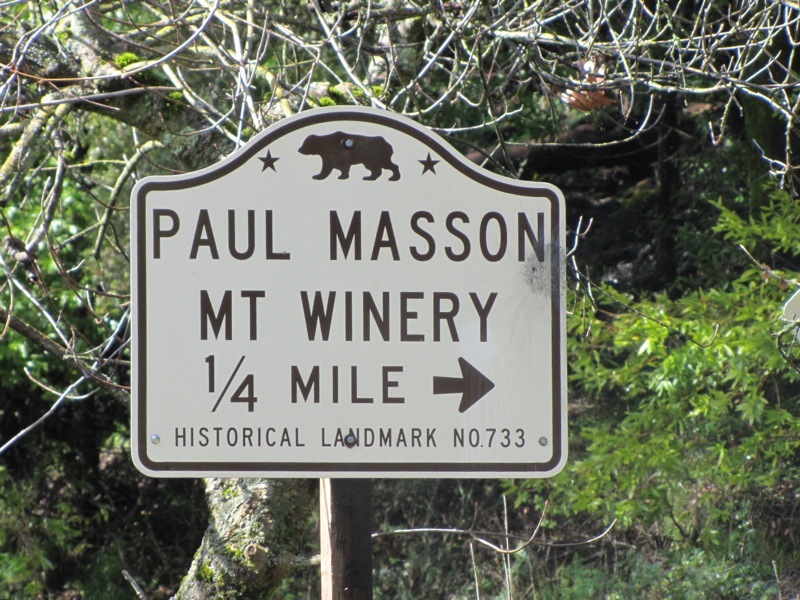 Masson was already known for his California “Champagne”. He grew grapes in the region until 1936, when he sold the vineyards to Martin Ray. Ray immediately pulled out the grapevines Masson had planted, and replaced them with Chardonnay, Pinot Noir, and Cabernet Sauvignon. The grapes that now dominate the area. Ray was also the first known winemaker to produce single varietal wines, as most California wines were field blends of different grapes. Prohibition, as in other wine regions, had a huge impact on the premium wine business in Santa Cruz. Matter of fact, Santa Cruz was the birthplace of California's temperance movement. The wineries that survived produced “medicinal” or sacramental wine, while others simply went underground. The first winery to emerge from Prohibition was run by the Bargetto family. John and Phillip Bargetto opened their place in Soquel in 1933, and are still in business today. 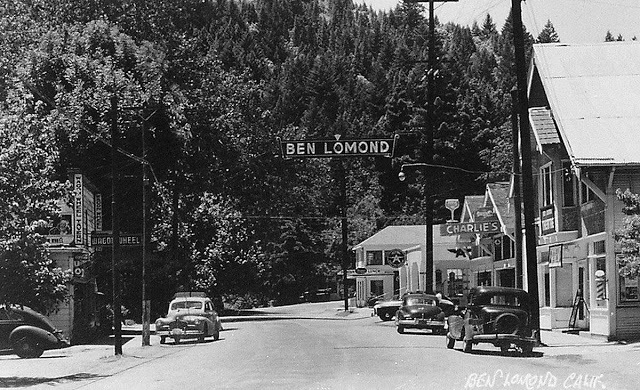 In the 1960s and 1970s, there was a resurgence of winemaking in the Santa Cruz Mountains. By the early 70s, a small group of Santa Cruz Mountain winery owners applied to create their own AVA. By 1981, the Santa Cruz Mountains AVA was established. It was one of the first AVA’s recognized by altitude (from as low as 400 feet, to as high as 3,200 feet) and defined by its mountain topography. The Santa Cruz Mountains AVA is a mountainous area (who woulda guessed, based on the AVA name? ), bounded by Half Moon Bay on the north, Watsonville (the flatter “vegetable bowl “area) and the Monterey Bay to the south, and Silicon Valley to the east. The appellation encompasses about 400,000 acres, within three counties: Santa Cruz, Santa Clara and San Mateo. Only about 1,500 acres are currently planted with vines. The appellation can really be split into two different growing regions. The west side of the mountains faces the Pacific ocean, and is often covered in fog. This cooler region can be looked at as more “Burgudian” in style (more Chardonnay and Pinot Noir). The eastern side of the mountains is Bordeaux region, where you’ll find Cabernet Sauvignon. The east side is influenced by the warmer San Francisco Bay. Needless to say, there are many micro-climates throughout the region, just as there diverse soils. The most sought after soil, limestone, is present in many of the finer vineyards in the area. Sun exposure and elevation further influence the vineyard, and make this appellation one of the most terroir driven regions in California. There are numerous sub-regions within the Santa Cruz Mountains AVA: Skyline, Saratoga/Los Gatos, Summit, Coastal Foothills, and Corralitos/Pleasant Valley. 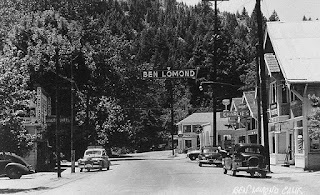 Additionally, Ben Lomond Mountain AVA is within the Santa Cruz Mountains AVA. Some of the oldest wineries in California are located in this AVA. If you watched the movie “Bottleshock”, you would be familiar with the 1976 Judgement in Paris. While the focus of that movie was on Chateau Montelena and their Chardonnay, there was also a red wine tasting. One of the red wines that competed (a 1971 Cabernet) came from Ridge Vineyards, while another white (a 1973 Chardonnay) came from the David Bruce Winery. When you look at a map of the Santa Cruz Mountains, the wineries all look fairly close together….that is until you actually get up in the area. As we found out, many of the roads are single lane, deadend roads, that require you to drive long distances to see one winery, then head back to the main road, only to head up another deadend road for the next winery. In my next article, I will share my 4-day tasting trip to the Santa Cruz Mountains, and some of the great finds of the trip.